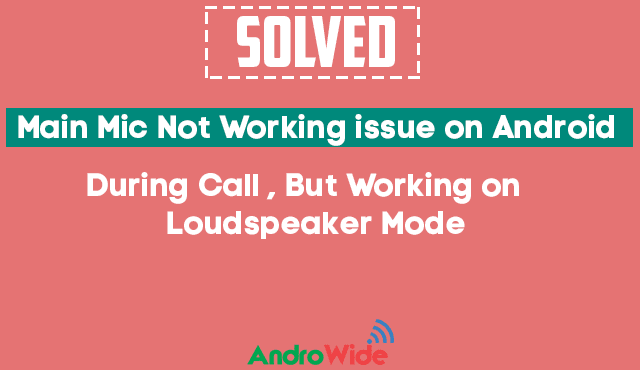 This is problem consumes a lot of time of myself to identify and fix this issue with my redmi note 3 on which the person i was calling was not able to hear me, and when i put my phone on speaker mode than they could hear me clearly. And even i was able to place WhatsApp calls with no issues as my main mic was properly working with these kind of apps, but not working on the Call App. And also I found I was able to Record Audio using my android phone's main mic, so I thought this issue is not a hardware issue, as I was pretty sure that the Main Microphone issue is a Software Bug. so that why I have done this experiment on my Redmi Note 3g, on which any one is not hearing me on normal mode call but able to hear me when i put on speaker mode, and also Earphone also working fine. As I have searched for the solutions of this Microphone issue on Android Device, i have seen many other phones Like OnePlus, Lenovo, Samsung, Xiaomi etc. also having the same issue of Main mic is not working on call, but does in speaker mode. First of all, I would like to explain why the Microphone is not working only during calls, the main reason as per my observation is the phones software is not communicating properly with the Phones Hardware, so we can say it could be Android Kernel Issue, as we know that Android Kernel works as a Mediator between Any Phone’s Software and Hardware. So first I din a factory reset to solve this mic problem in my phone, but I failed to get it back on the work, then somewhere I have got the info to clear the Data of Default Phone App in Android will fix the issue, but also this time got failed. Even I downloaded the official ROM for Redmi Note 3G and flashed it twice, thinking that accidentally I have deleted some system files, but….that could also not fix my issue. Then I have tried the method which worked for me to fix the mic issue on android device during call. First of all I did ROOT my Redmi Note 3G, (you can also try the same method for yours), so that I can Flash any custom ROM on my Phone, then I have downloaded the Resurrection Remix ROM and Flashed it on My Android Phone, hoping that it could fix my issue of Main Microphone not working on call, I what I found is the main mic worked for me, and it saves a lot of time and money too, for myself. Conclusions: This is totally a software bug and could be fixed by trying different Custom ROMs, I know this will not be easy for everyone to flash the ROM on their Phones, but as of now this is the only Method which is working to Fix this Microphone Issue on Android Phones.